The 22nd Amendment is about the limit of a Presidential term. Summary: The 22nd Amendment was ratified in 1951, during the administration of Harry Truman, stating that a person may not be elected President more than twice. When was the 22nd Amendment passed? Amendment XXII was passed by Congress on March 21, 1947 and ratified on February 27, 1951. 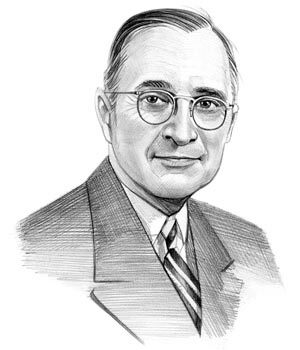 Harry Truman was the 33rd President of the United States whose presidency spanned from April 12, 1945 to January 20, 1953. One of the key events during his presidency was the ratification of the 22nd Amendment to the Constitution. The cause or reason for this addition to the Constitution was to due to the long presidency of FDR who had been elected President four times. All other presidents, up to the FDR presidency, had served a maximum of 2 terms and a limit on presidential terms was greatly supported. But this Article shall not apply to any person holding the office of President when this Article was proposed by Congress, and shall not prevent any person who may be holding the office of President, or acting as President, during the term within which this Article becomes operative from holding the office of President or acting as President during the remainder of such term. Explanation & Meaning: A person shall not be elected president more than twice. If a vice president becomes president, on the death or removal of the president, and serves more than 2 years as president, then he can only be elected as president once. This will not stop the current president (Harry Truman) from being elected president two, or more, times. Meaning: This will not become part of the Constitution unless three fourths of the state legislatures ratify it within 7 years. The above information provides the text, definition and summary of the amendment. The following Harry Truman video will give you additional important facts and dates about both the personal life and political life of the 33rd President of the United States whose presidency spanned from April 12, 1945 to January 20, 1953.